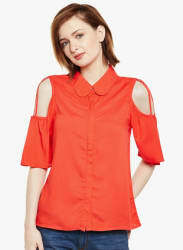 Double your fashion flair wearing this red coloured shirt from the house of Latin Quarters. Fashioned using rayon, this shirt will keep you at comfort all day long. Designed to perfection, this classy top will look great when clubbed with trousers and black pumps.